When I headed out to Las Vegas Feb. 18 for the 2008 T.R.A.F.F.I.C. West conference the Super Bowl game that had been played two weeks earlier was still on my mind. The underdog Giants had knocked off the unbeaten and presumably unbeatable Patriots in one of the best NFL championship games ever. The game brought back a lot of memories because I had the opportunity to cover several Super Bowls when I was a TV sportscaster in in the 1980's. In that era the transformation of the Super Bowl from football game to one of the country's premier business events was already well underway. Then as now just about every major corporation set up tents, threw great parties and sponsored special activities that drew clients and potential business partners like bees to honey. I was thinking about this on the way to Vegas because if the domain business has a Super Bowl the T.R.A.F.F.I.C. conference is it. 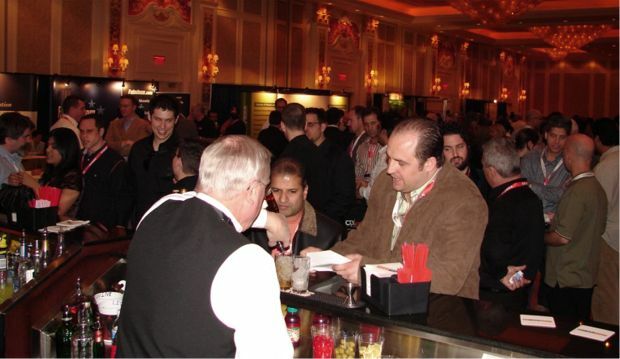 Just about all of the industry's major players would be there, the parties are fabulous and the special events are plentiful (they had actually begun with an exotic car Road Rally the day before I arrived for the start of the conference). Like Super Bowl week, T.R.A.F.F.I.C has blossomed into an extravaganza that has become more than a trade show. It attracts ambitious business people who know the event's festive atmosphere is conducive to getting deals done. So I was looking forward to this 10th outing in the T.R.A.F.F.I.C. series at the Venetian Hotel. I've been to 9 out of 10 of them, missing only Las Vegas in 2005 because my daughter was graduating from high school that week (I'm looking forward to taking her to her first T.R.A.F.F.I.C. show in May when conference organizers Rick Schwartz and Howard Neu will be staging their first family oriented event at Walt Disney World's Grand Floridian Hotel). Knowing the show's track record I arrived in Las Vegas with high expectations, and once again those expectations were fully met. welcoming ladies to a Day at the Spa My wife and I arrived at the Venetian a couple of hours before the kick-off party, just in time for Diana to take advantage of another one of those "special events". Since the guys got to do their thing with the Sunday Road Rally, LeaseThis.com decided someone should so something special for the women too. They made it happen by hosting a day at the hotel's prestigious Canyon Ranch Spa where the ladies were pampered with a massage, facial or pedicure - a nice gesture that I'm sure was widely appreciated. Domains have traditionally been a "male sport" but that has been changing in recent years and I'm glad to see it happening. I think all of the major domain conferences have been very well-run events, but if I had one criticism it would be that the social activities surrounding the shows have been geared too much toward men only. 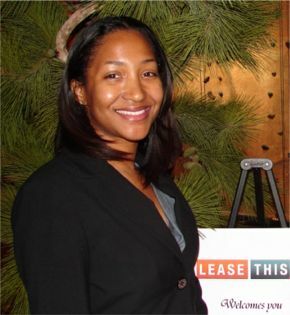 I'm hopeful that the LeaseThis event will be the first of many more with female attendees given equal time and attention. As soon as Diana was back from the spa it was time to head to the ballroom for the welcoming cocktail party, always an electricity-filled event at T.R.A.F.F.I.C. With 530 registrants on hand the room was soon buzzing with activity. Some of the talk centered on another T.R.A.F.F.I.C. first, a limited or no reserve live auction that Moniker would conduct right after the cocktail event. This was a prelude to their main live auction (under the SnapNames Live banner) on Wednesday afternoon. This auction "appetizer" featured a short list of names but still generated close to $200,000 in sales. Wall to wall crowd at T.R.A.F.F.I.C. West welcoming cocktail party Feb. 18. I mentioned at the start of this review that T.R.A.F.F.I.C. has become the place to get face to face business deals done. After show hours, many companies host private dinners, hospitality suites or parties to introduce new business initiatives. That's why Bido.com (a new company I am involved in with three partners) chose to stage its launch party at T.R.A.F.F.I.C. after the show's opening day concluded with the Moniker auction. The Bido party drew a capacity crowd to the Venetian's Tao Nightclub. As much as I respect words I have to agree with the old adage that a picture is worth a thousand words - and a video is even better! Since TV production pros Warren Walker and Marcia Lynn Walker of DomainerTV.com were on hand to videotape the Bido event I will direct you to their site to get a real feel for the atmosphere there and interviews with attendees and several company principals (Warren and Marcia asked me do the interviewing since prior to that night no one in the crowd knew what Bido was going to be about). Internet the domain is the center of everything. "The house can burn down, but the land still stands," he said. With respect to domains Schwartz has always been the eternal optimist but he is concerned that the value of domain assets have increased so much that predators are now looking for ways to separate domain owners from their assets. We saw a prime example of that this week with the introduction of a new bill in the U.S. Congress that could have a disastrous impact on domain owners if dangerous language in that bill is not changed or removed. 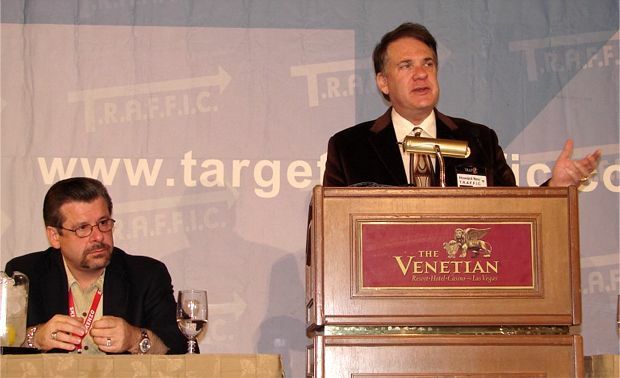 I talk about that development in our February Newsletter so I won't belabor the point here, especially since Internet Commerce Association Legal Counsel Phil Corwin and Executive Director Michael Collins also had plenty to say about the challenges facing the industry when they followed Schwartz and Neu onstage. Corwin and Collins had just returned from representing the ICA at the ICANN meeting in New Delhi, India. Though domain owners pay all of the freight in the domain registration business (and those registrations provide an estimated 40% of ICANN's operating budget) Collins related having a discussion with a new ICANN board member who didn't know the "domain business" even existed. It's little wonder then that the industry has had no representation within ICANN. ICA hopes to change that by joining ICANN's Business Constituency where the non-profit trade association has been provisionally accepted for membership pending review of some required documentation. Corwin noted that without the ICA's current presence in Washington, D.C. there would be no one to speak up for domain owners when legislation like the bill we saw introduced this week is proposed. He added that those who want to get their hands on domains they are not entitled to are not content with the fact that the existing WIPO and UDRP systems already rule against domain owners in the vast majority of cases. They want to get the law of the land changed so there will essentially be no barriers preventing them from taking the names they want. 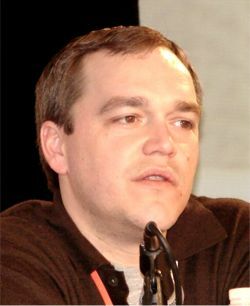 Corwin urged domain owners to get involved in determining their own future by learning more at InternetCommerce.org and joining the ICA as a member. I am on the ICA's board of directors and am in full agreement with Phil and Michael. Without broad based support and funding from the domain community, this war (and many livelihoods) will surely be lost. Schwartz and Neu established "Transparency" as the overall theme for this edition of T.R.A.F.F.I.C. so appropriately the opening educational seminar was titled Transparency in the Industry. In today's system, few if any domain owners know how much money their domains actually earn (before the money starts being divvied up) and what percentage of those earnings actually filter down to them after monetizers (including Google, Yahoo and the various parking companies that provide their feeds) take their cuts. This panel featured Jamie McMillan (Linkshare.com), Michael Gilmour (ParkLogic.com and WhizzbangsBlog.com), Jonathan Boswell (LeaseThis.com), Tom Cuthbert (Click Forensics) and Rick Schwartz. Several panelists called for independent third party auditing of PPC providers since domain owners currently have nothing but a promise they are getting what they deserve. Another issue is that there are no standard metrics. Each parking company has their own definition of what constitutes a click or a unique visitor, making it impossible to do meaningful side by side comparisons. 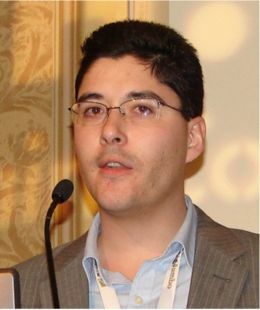 WhizzbangsBlog.com Gilmour has been one of the leading advocates for change and increased transparency in the monetization process and has written extensively about it on his blog. Gilmour said "getting real transparency and a uniform set of standards is a passion of mine because those things are the key to getting higher valuations of domain names." Gilmour said many advertisers are currently reluctant to spend in the PPC space because there are no standards and little insight into what is now a very arcane process. He said domain owners are also getting disenchanted with parking as a form of monetization. He cited a survey asking domain owners why they were moving to or considering moving to different business models. 23% said they would leave because of lack of transparency, 13.5% said they did not trust their parking company and the same percentage cited wildly fluctuating earnings per click. Gilmour pointed out that it is in the PPC companies' own best interests to embrace standards and transparency if they want to keep their customer base. Of course, there is always a lot of finger pointing at the giants at the top of the monetization mountain - Google and Yahoo! - when the issue of transparency comes up. One of the most interesting things I heard at the show (actually in a meeting right after the show) was a comment from a major figure in the Internet advertising space (not a domainer) who said he was working on a new platform that could quadruple domain owner's earnings and free them forever from reliance on Google and Yahoo. We all know talk is cheap, but this individual's company already has a well established business relationship with major advertisers and ad agencies and I would not discount anything that he has to say. He is at an exploratory stage now and said if he pulls the trigger his system could be live in 6-12 months. My guess is that whether it is done by his company, or someone else, given the growing level of dissatisfaction with the present system among domain owners (and barring any major changes in the status quo), new ad platforms are coming that will change the current landscape considerably. It is just a matter of time. During the noon lunch break, Fusu.com founder Tobias Ratschiller talked about his new domain "stock exchange" service. It allows domain owners to sell up to a 45% share of a domain name to investors on the Fusu market. It is an interesting idea with a lot of potential but many questions are still to be answered and hurdles to clear - for example, are these securities that would be subject to SEC regulations in the U.S. (the company is based in the Slovak Republic)?, does the investor get a proportionate share of the domain's PPC or business revenue? I understand the answer to the latter is no - that the primary upside would be getting a proportionate share of the sales price of the domain if the owner decides to sell it, or getting a higher price from other share buyers if domain values continue to go up. Fusu has already succeeded in getting some high profile domains offered on their site (and gotten shares sold in those domains), including Warning.com, Eel.com and Flowers.mobi. I have heard both pro and con arguments from experienced domain owners about the viability of this new platform and it is one that warrants further study before I could make an informed judgment. I do think that something like this, if done right and in compliance with applicable financial laws and standards, would open domain investment to a much broader range of people, especially those who cannot afford to buy a high quality generic domain outright. However, my initial gut reaction is that the system currently has more advantages for the domain owner than the share buyer. I think the interests of both will have to be equally balanced for a stock system to gain broad-based acceptance. Fusu does have first mover advantage so if they gain enough buyers and sellers to develop a liquid market and successfully allay concerns that have been expressed they could certainly make things interesting. After lunch, transparency was again the topic of discussion - this time from the advertiser's point of view - in a panel titled Gaining the Trust of the Advertiser. Michael Gilmour and Joanthan Boswell returned to the dais for this discussion and were joined by Hal Bailey (Google.com), Ammar Kubba (TrafficZ.com), Dr. Chris Hartnett (founder of USA Global Link) and Divyank Turakhia (Skenzo.com). Gilmour showed a slide stating the Internet Advertising Bureau's demand for transparency. The IAB statement said "The goal of the IAB and the entire interactive industry is simple: to achieve transparency in audience counts and revise out-of-date methodologies. For the interactive industry...integrity in audience measurement is a fundamental necessity." In view of that, the current lack of transparency goes a long way toward explaining why the Internet's share of the global advertising business is still in single digits even though more than 20% of media is now consumed online. orders should stand up to them. Johnston, who is Sedo's General Counsel, said a lot of unjustifiable claims are made with the hope that the domain owner will turn over the domain without a fight. However when the domain owner points out that there is no basis for the claim the C&D sender usually disappears. I personally had that happen recently when the Mall of America (a big shopping center in Minneapolis) sent me a C&D letter telling me I had to give them MOA.info. I pointed out that MOA could mean many things, that there were no Mall of America or shopping mall links of any kind on the domains landing page and more importantly that Mall of America did not even hold a trademark for MOA! I never heard from them again. Keating emphasized that you do need to respond to C&D letters, UDRP actions, etc. otherwise you will lose by default. Keating also said he felt domain owners were suffering a death by "paper cuts" as their rights are steadily being eroded bit by bit. "We have to stand up as a community - otherwise we give up the field one yard at a time," Keating said. All of the attorneys on this panel have freely given their time to serve on an advisory board to the Internet Commerce Association, helping with the kinds of issues Keating spoke about. His hope is that the community will step up enough to provide funding that would allow the ICA to defend key test cases in court that would reverse the trend of decisions and actions going against domain owners because they have not had representation at the table while precedents were being set. The final seminar of the day centered on the Potency of Traffic and featured discussions about how monetization companies determine the difference between high quality traffic and junk traffic and how advertisers view traffic from the domain channel. This panel featured Matt Bentley (Sedo.com), Adam Dicker (GoDaddy.com), Donny Simonton (Parked.com), Ofer Ronan (Sendori.com) and Dan Warner (Fabulous.com). There is a big difference between different kinds of traffic. Ronan said type-in traffic has the highest conversion rate while arbitrage (recently banned by Yahoo) has the lowest. Having to pay for poorly converting traffic has led some advertisers to bypass the entire domain channel. Google makes it easy for those who do not want it to opt out of advertising on domain landing pages. Walking away from high powered type-in traffic is like throwing the baby out with the bath water, but some advertisers have taken that step, in some cases because they are not aware of the differences between different kinds of traffic. Bentley said Sedo attends many advertising conferences to dispel misconceptions and gain greater support for the domain channel. Those efforts are needed as revenue from PPC has been falling in recent months. Warner said that trend could get worse if the industry doesn't clean up trademark and traffic quality issues. Warner said that the domain channel only accounts for 3.5% of Google's overall ad revenues and it is possible that they could pull the plug on the whole channel rather than deal with headaches like TM issues. 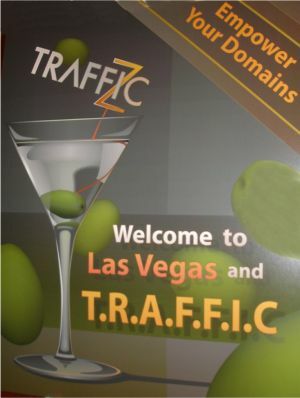 After that final seminar, attendees gathered for a networking cocktail party followed by a dinner hosted by overall show sponsor TrafficZ.com. During dinner TrafficZ COO Ammar Kubba showed some highlights from the company's new 5.0 parking program. 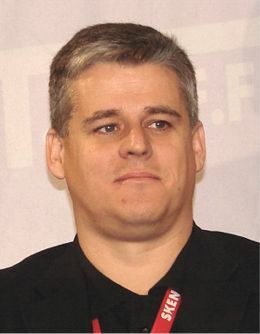 Howard Neu also gave more details about the first international T.R.A.F.F.I.C. show, T.R.A.F.F.I.C. Down Under, that is coming to Australia's Gold Coast November 18-20 with Fabulous.com hosting that event. 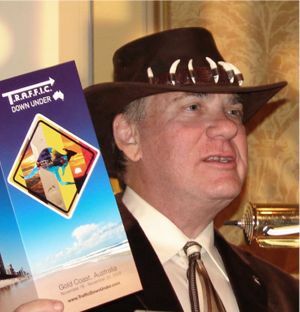 Neu also held a drawing to give away the Aussie hat he wore during his announcement about T.R.A.F.F.I.C. Down Under and the winner, ironically, was an Australian who probably already has a dozen of these - Michael Gilmour. (and out of the goodness of his heart which is very real), Gilmour had a number of domain industry leaders sign the hat then donated it to Moniker so they could auction it off at the Wednesday afternoon live auction with the proceeds going to the Internet Commerce Association. When the hat was put on the block the next day Page Howe (like Gilmour, one of the true nice guys in this indutsry) paid $5,000 to get it. 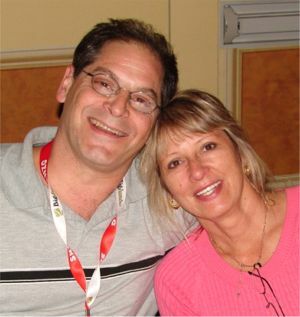 Another major supporter of the ICA, Nat Cohen, raised another $8,000 for the ICA by donating the domain RVJ.com that was auctioned off on behalf of the organization. I'm seeing more and more generous people like this step up for the good of the industry. Elliot Silver who won the 2008 Domainers Choice Award in January for Best Blog is another guy who has devoted time, money and domains to the cause. Despite being in the industry a relatively short time, Silver quickly grasped what is an stake and he is becoming a real leader in this space. After dinner Tuesday night, it was time for one of the show's highlights, the keynote speech from 1-800-Flowers.com founder and CEO Jim McCann. 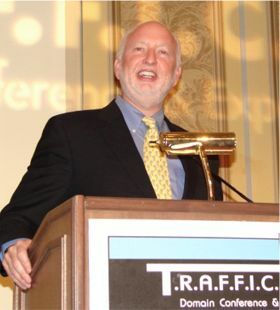 His company (also the owner of Flowers.com) turned the flower industry upside down, unseating long time ruler FTD.com who now only does about a third of the business 1-800-Flowers does. McCann is a terrific speaker - down-to-earth, funny and informative. 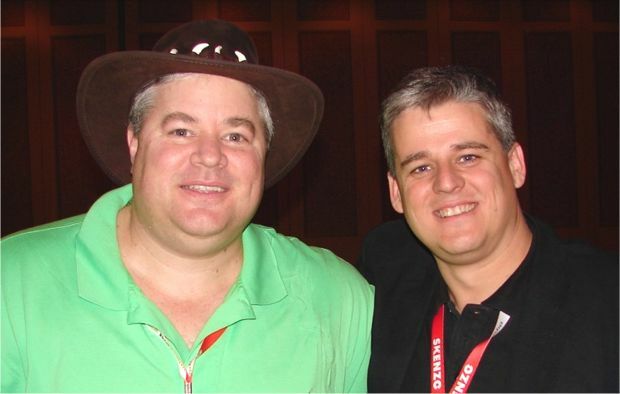 McCann was one of the earliest domain name owners, registering his first domain in 1992! He had started his flower business by buying a little shop in New York City for $10,000 in the mid 80's, then bought a near bankrupt order-by-phone flower company in Texas that turned out to have more problems than he realized. It took him years to get it turned around, but in 1991 1-800-Flowers scored a major breakthrough when an ad campaign on Ted Turner's cable TV Super Station produced a wave of orders than has only grown year after year since then. In 1992, realizing that domain names could serve a function on the Internet similar to 800 numbers in the offline world, he started acquiring domains relevant to his business. stays awake at night worrying about kids who are thinking about how to knock him off. Looking around the room McCann said I see an awful of you guys staring at me - I think I walked into the wrong lion's den here! I have no doubt that he is right that some of tomorrow's business giants were sitting in the audience that night. McCann closed with a funny story about a mix-up at his original flower shop. One of his best friends ordered a wreath to display at the opening of his new business. Soon after the opening the friend was on the phone to McCann and was extremely irate. McCann couldn't understand because he had personally seen the wreath being made and it was beautiful. He recalled that only one other wreath was being made at his shop at the time. Within minutes a call came in from another incensed customer who had ordered a wreath for a funeral. It turned out that the deliveries got mixed up and a wreath arrived at his friend's business with a ribbon on it that said "Rest in Peace". Meanwhile across town, another wreath was unveiled at the funeral with a ribbon that said "Good Luck in Your New Location!"